Its passage was lit by the usual lamps. Several of Collier’s stories were adapted for Alfred Hitchcock Presents and he was an inspiration for Rod Serling, which is obvious enough after you’ve read some Collier for yourself. In this particular story (collected in Fancies and Goodnights), the hero, Louis, commits suicide in a hotel room near Piccadilly Circus. But rather than melting into a desired oblivion, he finds himself still conscious – dead, but self-aware and able to move spectrally about, invisible to the living. He steps out for a walk and is accosted on the street by a devil who announces his intention of delivering him to hell. Louis manages to distract the devil with liquor, and comedic adventures follow. But at one prickly point in the story, when the devil drags him down into the Piccadilly Circus tube station, Louis catches sight of an escalator shaft he’d never noticed before. It’s down this that the souls of the departed and their fiery escorts make a long final descent. The shaft appears bottomless and has an odd reek of sulphur about it, but is nonetheless “lit by the usual lamps” – the same as one finds in any other tube shaft. Which seems right: hell would have to be as mundane as that. It was an instructive, well-earned and ridiculously warm weekend. The wife and I managed an escape from house and children to spend two nights holed up at the Goose and Turrets, a charming little inn on the coast at Montara, twenty miles south of San Francisco. The grand three-storied house is a century old, set on a green property thick with fuchsias and fruit trees and wrapped about by a giant hedge like a castle wall that keeps out everything but the fog and the hummingbirds. In the black of night, reading before the fireplace of our pine-floored room, the crash of colossal autumn breakers at the shore can be heard from a half mile away. We spent Saturday and Sunday in the city. San Francisco is famous for cold summers, but the latter half of September is gorgeous. This year, that late September glory passed well into October and we found ourselves in shirtsleeves seated outdoors for afternoon tea, carrying our jackets rather than wearing them as we threaded a path below the skyline – astonished, despite the calendar and the fear for the economy, by the great parade of flesh and credit cards in the Union Square shopping district, and the children playing in shorts while parents dozed comfortably on the grass at Yerba Buena Gardens. Given the passions of the presidential election and the daily carnage of the economy, it’s an odd time to indulge in a weekend away. But such are the sacrifices we make for civilization. It’s a raid on the barbarism of the age to sit at breakfast with strangers, to argue what is true patriotism and what sentimental claptrap, to map out schemes for agriculture, healthcare, and market reform, and to revisit all the absurdity, demagoguery, and serial elations and disappointments of a long, long campaign cycle. It’s an even greater triumph of democratic discourse to change the subject – without drawing blood – to the lovely patterns on the china, the portrait of Marcel Marceau on the wall, the economics of travel by small plane, or the question of where to get a decent dinner. There is a peculiarly American habit of thought that allows us to imagine we are so individually determined as to owe little or nothing to the nurture of our country or the contours of its history, and that we owe even less to our fellow citizens. It is a pleasure to be reminded now and again what a lie that really is. It’s enough to throw you into despair: to read everything, and remember nothing! Because you do remember nothing. You may strain as much as you like: everything escapes. Here and there a few tatters remain, fragile as those puffs of smoke left over after a train has passed. Collecting quotations out of books, then, may be likened to bottling little puffs of steam. It’s a hedge against forgetfulness, but not very effective. I periodically resolve to exercise my memory (poor atrophied organ) by committing this or that to its shelves, but outsourcing to paper is too economical a temptation. He had, by now, the look of a man who was waiting for something which had happened long before. It seemed to her that certain portions of the earth must produce happiness – as though it were a plant native only to those soils and doomed to languish elsewhere. Pliny the Elder, whose melancholy fate it was to become one of those ancient authors more quoted than read, described the salamander as “an animal like a lizard in shape and with a body starred all over; it never comes out except during heavy showers and disappears the moment the weather clears.” Which is a nice description for an unscientific age. 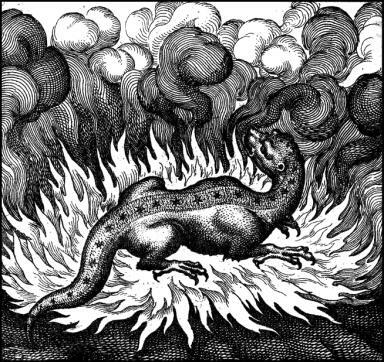 Pliny also says the creature is so cold it can put out a roaring fire by treading on it, and that sharing a cup with a salamander can kill you (which is true, but only if the salamander has died or been boiled in your drink). I came face to face with the salamander this past weekend. I was engaged in a mortal struggle with two juniper bushes on my property. These are those thorny, wicked sort of junipers popular with landscapers: evil vegetables that collect all manner filth in their underskirts and make impregnable redoubts for spiders and earwigs and other noxious bugs. Saturday, in heavy leather gloves, I came at the junipers with shears. By evening I had stripped them naked, reduced them to gnarled stumps that looked like nothing so much as two claw-like hands reaching up out of the earth. That evening, watering the roots to loosen the soil, I uncovered a little tunnel twisting downwards from the base of one of the junipers. There seemed no end to it. I turned the hose into the hole and ran it for five minutes before the water finally bubbled to the surface. In bed that night I had a vision of some eldritch earth-demon (rather like Blake’s Ghost of a Flea) lodged in the rock a hundred feet beneath my house, arms stretched up toward the surface: the claw-like stumps of my junipers were its hands. Next morning, with the help of my brother-in-law’s winch, we pulled the juniper roots from the wet ground – slowly, mercilessly. The roots cracked and groaned with the force of their eviction. Some minutes later, surveying the churned earth and the gaping voids where the stumps had been, I watched, dazzled, as a salamander came creeping out of the hole. I had the irrational conviction that this was the fellow responsible for my unsettled dreams the night before. Weird and slow, with blind bulging eyes and speckled all over with Pliny’s yellow stars, the salamander made straight for the steps that lead to my door, as if inviting himself for tea. Of course, I knew better than to join him for a cup. Everything in nature is lyrical in its ideal essence; tragic in its fate, and comic in its existence. One of Santayana’s more frequently quoted bits, usually accompanied by a photograph of a flower or some other cheery, ephemeral thing which seems effortlessly to embody its own ideal, ends regretfully in the mulch pile, and can look funny from a certain angle. But really, the sentence has teeth. Match it with a photograph of yourself instead.